As I posted in early July, we received a wonderful gift of a lot of strawberries. I chose to juice most of them and they have been sitting awaiting a good inspiration. There is lots of strawberry jam around so I wanted to make something different while still retaining the wonderful strawberry flavour. Would this product be a jam or a condiment? Well - we decided to make a crossover - something that would be tasty for those who like a jam with interest ... But ... also could be used as a condiment for those who like a sweet compliment to meats. I think we succeeded. I took it to one of the markets the last 2 weeks and the tasters were pretty equally divided about whether it was a jam or a savoury. It will be going out to the all the Edmonton markets this week and here are some ideas about how to use this unique taste treat. 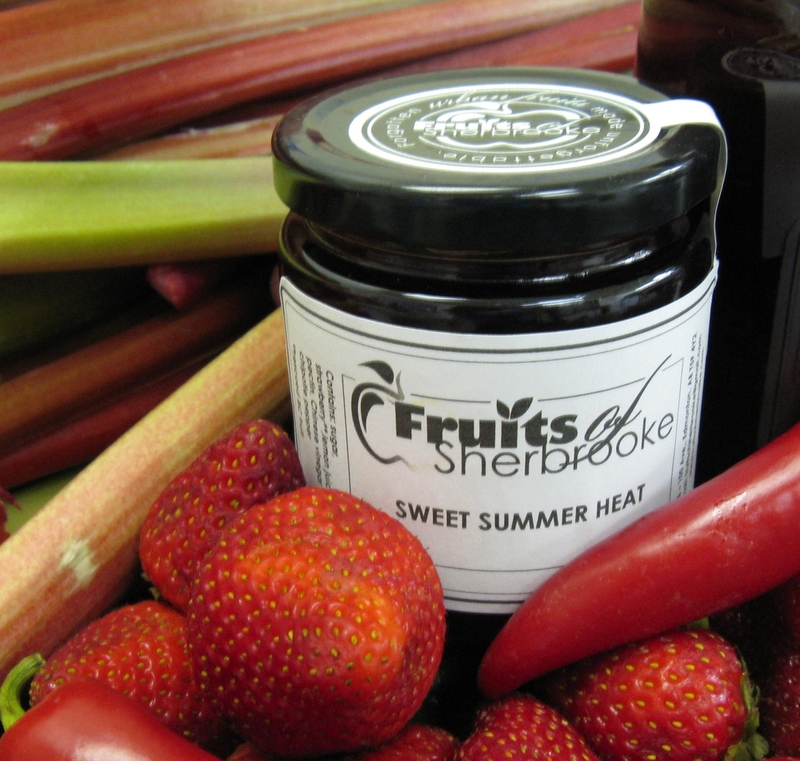 Flavour Profile: it starts with the full taste of sweet summer strawberries filling your mouth and just at the end - as you swallow - a light lift of chipotle chilis becomes present. This finish cuts the sweetness and brightens the mouth with a little surprise. As the cooks at Fruits of Sherbrooke, we think it is pretty brilliant!! Uses: * Some people have used it to spark up a PBJ sandwich or just plain on toast. * Others have used it on cream cheese and a bagel or with cheese and crackers. * Use it as a glaze when cooking chicken, fish or tofu. As it is a jelly, I would suggest putting the meat or fish on a large piece of parchment or foil , topping it with a couple of spoonfuls of Sweet Summer Heat and then closing the package and baking in the oven or on the BBQ. * What about a salad with a protein of your choice, lots of greens, perhaps feta cheese, some pecans or pumpkin seeds and a dressing with Sweet Summer Heat in it. Make an oil and vinegar dressing or use a mayo dressing and add 2 or more Tablespoons Sweet Summer Heat to the dressing. This will make it a wonderful fruity dressing with a touch of heat. You can always add extra heat by adding chopped hot peppers or a touch of hot chili sauce. * Make a unique topping for a grilled steak. Have a few fresh strawberries chopped and if grilling meat on BBQ, put the strawberries in a small pan on the grill and when just heated add a couple of Tablespoons of Sweet Summer Heat to the berries just until heated. Taste and add extra chili if desired. Remove steak from the grill and top with the Strawberry Sauce. If steaks are cooked in a pan, add the berries and Sweet Summer Heat to the grilling pan as soon as steaks are removed then pour over meat to serve. * What about desserts? In a microwave glass bowl, heat a few spoonfuls of Sweet Summer Heat for about 10 seconds to just soften it, then toss with prepared fresh strawberries and pour over a cheesecake, ice cream or mix with an alcohol of choice for a summer drink. Availability: This is a Seasonal Specialty. This means that we have a limited amount because it is not a regular fruit we rescue. It will be available at local Farmer's Markets and can be ordered by phone for delivery at markets until it runs out and that will be the end. During its availability we will accept request for delivery but these will be filled only if available. Comments: This product has been fun to create and we hope it will be fun to use. We thank Walker's Own BC fruits for their generosity in gifting us with the strawberries. To be clear, they were past their prime for the markets but with diligent efforts by our fruit rescue team, we were able to sort through and find berries that were still full of summery goodness. We then had the joy of creating what we think is a unique gem! I just noticed that rhubarb seems to have pushed its way into the photo but it is NOT in the jar!! !